The power of Queen centralizing; The power of a Knight on e7 and f5; Rook lifting and traffic jams; Knight forks and attacks on superior pieces; All checks and captures; Interference; Counter attacks and more! 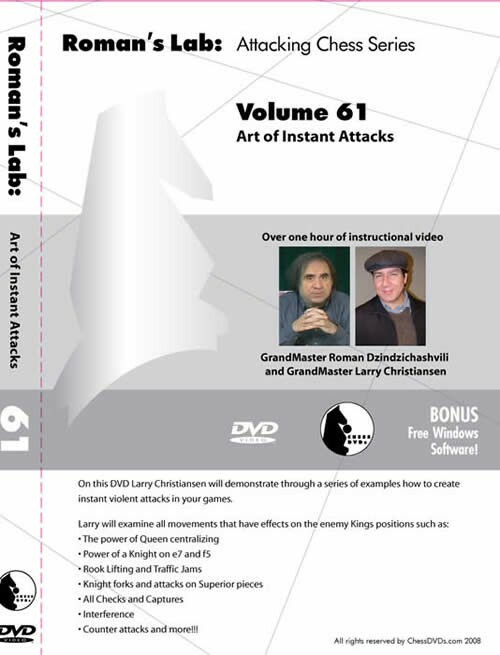 Over one hour of instructional video. Grandmaster Roman Dzindzichashvili is a former two time U.S. Champion & Russian Champion, and has won the World Open. He is a writer and teacher, plus the former chess coach & trainer for World Champions Gary Kasparov & Anatoly Karpov.